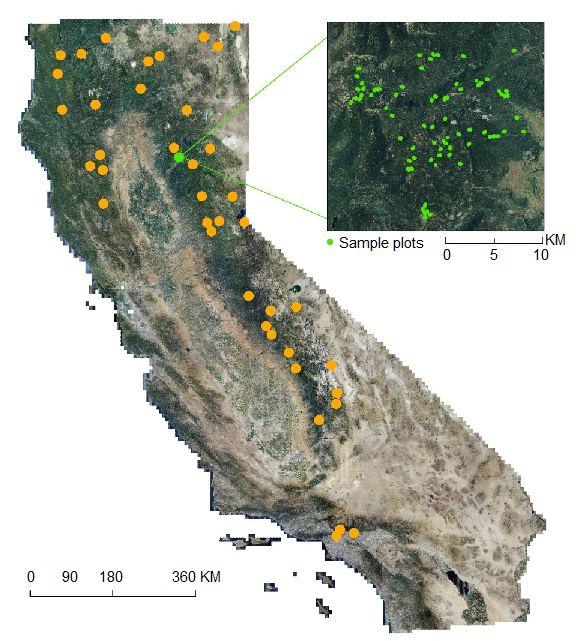 This dataset provides estimates of aboveground biomass and spatially explicit uncertainty from 53 airborne LiDAR surveys of locations throughout California between 2005 and 2014. Aboveground biomass was estimated by performing individual tree crown detection and applying a customized "remote sensing aware" allometric equation to these individual trees. Aboveground biomass estimates and their uncertainties for each study area are provided in per-tree and gridded format. The canopy height models used for the tree detection and biomass estimation are also provided. There are 9,504 files in compressed shapefile format (*.shp contained in *.zip) and 212 files in GeoTIFF format (*.tif) included in this dataset. Figure 1. 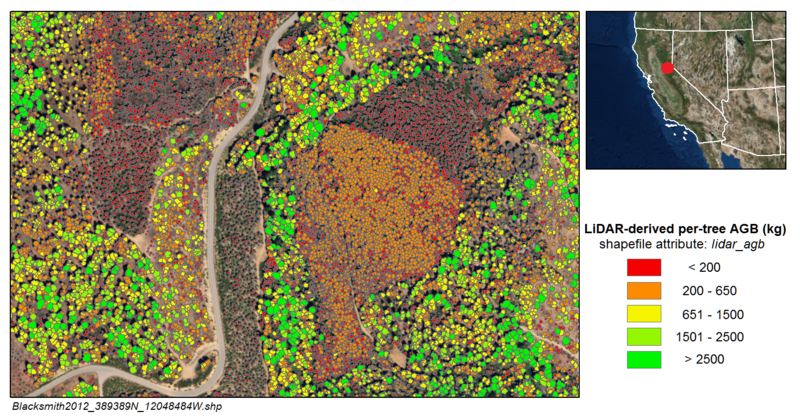 Per-tree aboveground biomass (kg) derived from LiDAR-measured tree heights for the Blacksmith site in 2012 (from Blacksmith2012_389389N_12048484W.zip). The study is funded by NASA Carbon Monitoring System (Proposal number: 14-CMS14-0048; Grant number: NNX14AO80G) under the title of “Reducing uncertainties in estimating California’s forest carbon stocks”. Spatial Coverage: Surveyed areas throughout California, see Figure 1. Temporal Resolution: Each study site was surveyed once. There are 9,504 *.zip files that contain compressed shapefiles (*.shp) and 212 files in GeoTIFF format (*.tif) included in this dataset. Shapefiles give the tree-level AGB estimates and uncertainties for a survey area. Spatial reference properties for the data files are listed below. GeoTIFFs give plot-level aboveground biomass (AGB) estimates and uncertainties for each of the 53 LiDAR survey areas included in the dataset as well as a canopy height model. A number of shapefiles with coverages ranging between 1- and 2-km2 are provided for each of the 53 survey areas. Each shapefile is provided in a zip (*.zip) containing four files (*.shp, *.shx, *.dbf, *.prj). Shapefiles are named according to the survey area, year, and upper-left coordinate of the bounding box encompassing the shapefile features, e.g. : <survey area><year>_######N_######W.zip. The shapefiles contain one feature per tree delineated from the canopy height model. The tree segmentation method is described in Section 5. Spatial data properties for the shapefiles are given below. Shapefile feature attributes, units, and descriptions are provided in Table 1. Table 1. Shapefile feature attributes, units, and descriptions. Four GeoTIFFs are provided for each of the 53 survey areas. Files are named by survey area and year followed by the measurement type. Spatial data properties for the GeoTIFFs are given below. Example filenames, units, and their descriptions are listed in Table 2. Table 2. Filenames, units, and descriptions for GeoTIFFs. This dataset is among the first examples of AGB estimation and uncertainty analysis based on an individual tree detection method. Aboveground biomass is an important metric for assessing carbon sequestration in forests. Estimates of uncertainty associated with the plot- and tree-level AGB take into account potential error introduced by the allometry, the remote sensing height measurements and the individual tree detection algorithms. Estimates of aboveground biomass (AGB) and their uncertainties were established at the plot- and tree-level. A "remote sensing aware" allometric equation relating LiDAR-derived height to AGB was used to estimate AGB and uncertainty at the plot-level. LiDAR-derived height estimates were used to determine and propagate tree-level estimates of AGB. Tree heights were measured using the individual tree crown delineation approach outlined in the flow chart in Figure 2. A local maxima-incorporated watershed segmentation algorithm (Gauch 1999; Pitkänen et al. 2004) was applied to the low-pass filtered CHM to identify each individual tree by delineating the crown boundary. Tree height was extracted from the maximum height value around each local maximum. Crown diameters were measured by taking the maximum diameter of each segmented local maximum. Other tree-level attributes were calculated as the distance to the nearest tree and mean distance to all trees in a sample plot, to account for the local stem density. Figure 3. Flowchart of the standardized preprocessing chain and individual tree detection. The "remote sensing aware" allometric equation relating per-tree heights to AGB in a species-agnostic fashion was developed using a generalized allometric equation approach calibrated using trees in the Forest Inventory Analysis (FIA) database. This approach applies published allometric equations compiled as part of the GlobAllomeTree database (GlobAllomeTree 2013) to estimate a distribution of AGB for trees in the FIA. The result was a database of AGB estimates that was used to generate a novel allometric equation for relating per-tree heights to AGB (Eq. 1; Xu et al. 2017). Estimates of uncertainty associated with the tree- and plot-level AGB take into account potential error introduced by the allometry and remote sensing height measurements. Detailed tree information for 8313 trees in 146 circular fixed-area sample plots in Lassen National Forest (USDA Forest Service; PNW-FIA Field Manual, 2015) was used to determine the LiDAR height measurement error, omission errors, and commission errors. The equations for deriving per-tree uncertainty (Eqs. 2-5), can be found in Xu et al. (2017). Plot-level biomass (Mg/ha) was obtained using a new method for predicting biomass density that takes omission and commission errors as a correction to the LiDAR direct detection of AGB. Plot-level AGB and variance are calculated using Equations 6 and 7 from Xu et al. (2017), respectively. Pitkäen, J., M. Maltamo, J. Hyyppä, and X. Yu. 2004. Adaptive methods for individual tree detection on airborne laser based canopy height model. International archives of photogrammetry. Remote Sens. Spatial Inf. Sci. 36 (Part 8/W2): 187–191.